Thousands of Fire and EMS professionals from all over the Eastern United States were on hand in Springfield Massachusetts recently for New England FIRE/RESCUE/EMS, one of the region’s premier public safety conferences. Based on the success of our ongoing collaboration and partnership, Symposium Technologies and FIREHOUSE Software® participated jointly, meeting with representatives from many fire departments looking for powerful, fully integrated and affordable emergency management solutions. 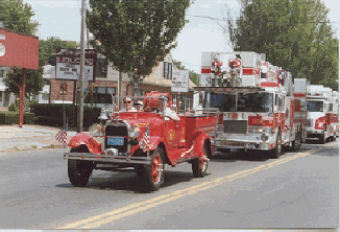 The conference – co-hosted with the New England Division of the IAFC, and the New England Fire Apparatus Maintenance Association – featured over 200 exhibitors, a wide range of educational seminars, and an impressive apparatus parade that drew over 100 vehicles from a myriad of departments far and wide. Another important factor that came up with many visitors to the booth was the whole issue of consumer choice. It’s a story Symposium’s Jeff Connors has heard before: “Nowadays interoperability is key, and the big thing people throw our way is that they absolutely need their systems to talk to one another. At the same time they don’t necessarily want to have to go to one vendor for everything because it limits choice, and they can end up getting locked in to a situation where they can’t change one thing without changing everything. By designing our system to be so open, we can work with an unlimited range of other vendor solutions, and integrate so tightly as to provide a superior level of capability. Bottom line, clients get the best of both worlds – full integration, full choice, and no headaches.” After all, it’s about making the technology work for you, not vice-versa.